New Discovery Of World's Oldest Stone Tools : The Two-Way Researchers in Kenya uncover tools dated to 3.3 million years ago, long before the first humans, as we know them, walked the Earth. 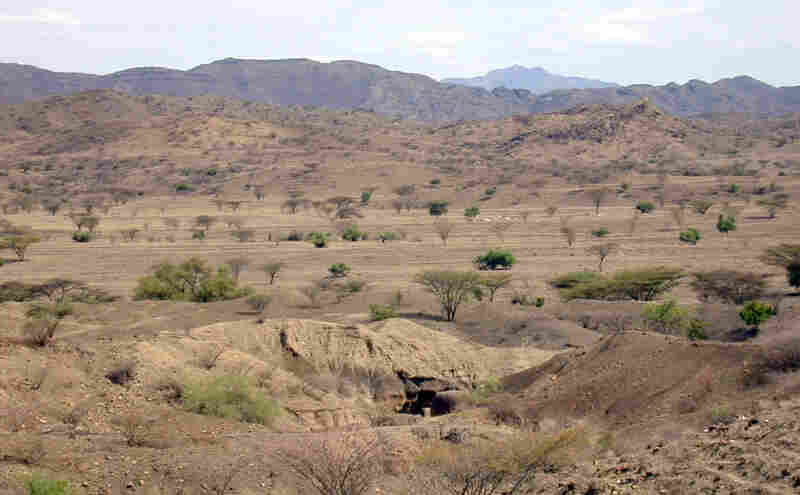 This undated image provided by the journal, Nature, shows an archaeological site, near Lake Turkana in Kenya. These newly discovered tools have been reliably dated to 3.3 million years ago, according to scientists who've reviewed the research. That's 700,000 years older than the previous record for the oldest stone tools ever found. That's remarkable because it's well before the human genus, Homo, emerged 2.8 million years ago. So clearly these early humans didn't make these tools. The team presumes they were made by an early ancestor of humans, probably a member of a genus called Australopithecus. The famous ape-like creature known as Lucy was from that genus and first appeared in Africa about four million years ago. Leading stone tool experts who've seen the tools say they have the markings of a process called "knapping." Knapping a piece of stone produces flakes that can have sharp edges and are useful for working with plants, nuts or meat. These flakes can be distinguished from naturally occurring pieces of rock. Knapping also leaves characteristic marks on the rock from which the flakes are chipped. Richard Potts, head of the Human Origins Program at the Smithsonian Institution, has examined the tools. He tells NPR they're a "mixed bag," with some quite crude and others a little more sophisticated. Potts says they're not as advanced as most early human-made tools, but "there's no doubt it's purposeful" tool-making. And it's more sophisticated than the kind of tool-making that chimpanzees do, he adds, such as shaping sticks to probe for termites in their underground mounds. Scientists who study stone tools say it's premature to say that these tools led to the evolution of the first humans, commonly known as Homo habilis, or "handy man" as they are sometimes called. The gap between these tools and the previous oldest known is so long — 700,000 years — suggests that whoever made these newly discovered tools could have died with the knowledge, and stone tools were "reinvented" again hundreds of thousands of years later. The discovery was announced at a meeting of the Paleoanthropology Society in San Francisco this week. It was first described in the journal Science.